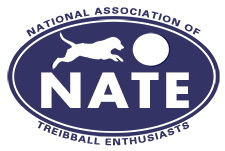 NATE has created a Skills Certification program to give our members a way to achieve goals and recognition outside actual competition or titling. The program can also be a way to test your team’s readiness for competition. There are three skill Categories – Distance, Directional Cues, and Pushing – with three progressively difficult Levels in each. The skills are tested independently of one another, to keep things simple. All tests assume the dog is capable of a certain degree of impulse control – e.g. will not bite the ball, and will wait for direction from the handler. This program is currently available only to registered members of the National Association of Treibball Enthusiasts. To join us, apply today! If you are already a member, click here for your next steps.